Florida Yorkie Rescue View other Yorkies for adoption. Ava is 2.5 years old and weighs 9 pounds. 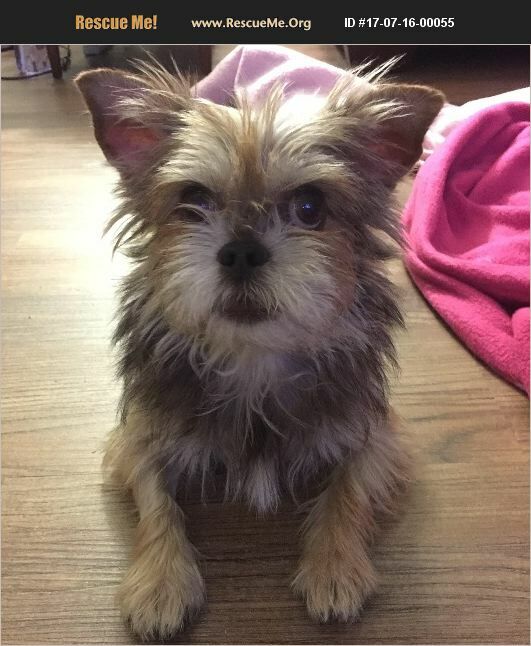 She is a Yorkshire terrier/Brussels Griffon mix. Ava is being fostered in Orlando, FL. UPDATED BIO 12/06/2017: Hi, I'm Ava. Let me tell you about myself. I recently had a dental and now my teeth are shiny white; I had one retained baby tooth and that was pulled during the dental. I am on monthly heartworm prevention and Bravecto for flea/tick prevention. I always let my foster mom know when I have to go outside to do my business. Don't tell anyone, but I sometimes ask to go out just so I can chase lizards and squirrels, hee-hee! I love to play with my toys and with my fur-sister, Leia. When I'm not playing, you can find me on my foster mom's lap, my favorite place to be. I love it when she holds me like a baby and talks to me. And I understand every word she says. Yes I do! When I first came to stay with my foster mom, I was a very sick little girl. I was so weak and anemic. The vet discovered that I had a certain type of anemia called Immune Mediated Hemolytic Anemia or IMHA. This is a condition where my white blood cells (the ones that fight the bad guys), started to attack my red blood cells before they could mature. The white cells thought the red cells were bad guys. This, of course, was not good for me. I had to have a blood transfusion that first week. Then I started taking Prednisone and Azathioprine (a chemotherapy drug). Gradually, I started to feel better and my energy and stamina returned. I am happy to say that all my blood counts have returned to normal and I have been off all medications for the past two months and I feel GREAT! Ok, now I will tell you what kind of furever home I need. If you feel your home would be perfect for me, click on the link below to complete/submit an adoption application. If you have questions, you can contact my foster mom at the email address below for more information. Here's what my perfect home would be: -	It would be best if my new mom and/or dad are retired or work from home since I don't want to be left alone for long periods of time. -	I can only be adopted into an adult-only home. Small children may pull on my ears or tail and accidentally hurt me. I would not like that and may get a little grumpy. -	Because I have IMHA, I can no longer be vaccinated. It might cause me to relapse and I definitely don't want that. No vaccinations means that I can NOT go to dog parks, doggy daycare, the groomers or for walks in the neighborhood. -	I MUST have a fenced yard. -	I would love it if there is another small doggie companion in the home for me to play with. The only request is that the other dog must be fully vetted (vaccinations, including Bordetella, heartworm prevention, flea/ tick prevention, annual vet visit/ more as necessary) and always kept up-to-date. I am a great little girl, just ask my foster mom. Please consider me when you look for a new companion dog to love. I'm so worth it. I'll definitely love you right back. I'll be waiting for you.